The Silentaire Val-Air 200-100 AL Ultra-Quiet Compressor is the noiseless solution to expert airbrush paint application. The Silentaire Val-Air 200-100 AL model is a compressor perfect for the professional artist seeking a noiseless solution to air brush application. Completely automatic, the Val-Air 200-100 AL is easy-to-use, and low maintenance. The unit comes equipped with an air tank, tank pressure gauge, line pressure gauge, pressure regulator, safety valve, built-in moisture trap, and air intake filter. Portable for travel to multiple project locations, the Val-Air 200-100 AL is outfitted with a comfortable carry handle and wheels. 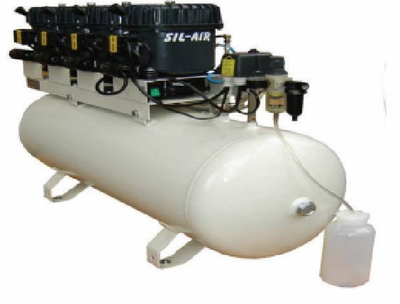 Made in Italy, this top of the line compressor unit is manufactured with a heavy-duty .5 horsepower "AL" pump featuring an aluminum head, and cooling fins. Rust resistant, the compressor also comes with an in-line coalescing filter to control oil mist. Available in 220volt/60Hz or 220volt/50Hz voltage units.